SONIC Gets Extra Cheesy with the Stack Cheeseburger | Sonic Corp.
OKLAHOMA CITY--(BUSINESS WIRE)--Nov. 1, 2018-- SONIC® Drive-In (NASDAQ: SONC) is updating another classic by welcoming the new Quarter Pound Double Stack Cheeseburger, a burger that includes cheese stacked between two juicy beef patties. SONIC takes its version of the stacked cheeseburger one delicious step further by adding not just one, but two types of mouthwatering melty cheeses to make every juicy bite better than the last. The SONIC Quarter Pound Double Stack Cheeseburger is full of flavor and bursting with melty shredded cheddar cheese and a warm cheddar cheese sauce layered between two 100-percent pure beef patties. 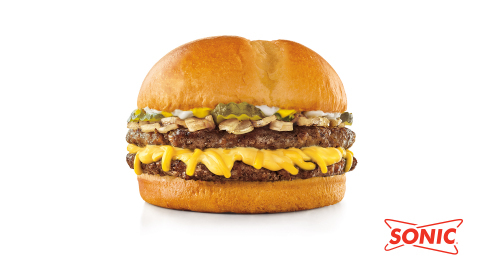 The cheesy, savory combination is served on a soft, lightly toasted brioche bun and topped with mustard, creamy mayo, crisp crinkle-cut dill pickles and grilled onions. Starting at just $2.99, guests can order the new SONIC Quarter Pound Double Stack Cheeseburger with medium Tots while supplies last*.